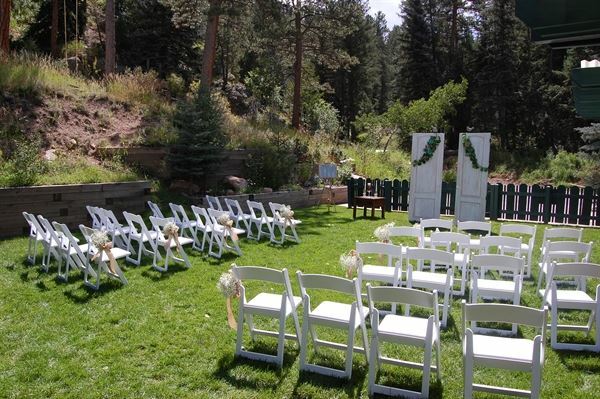 Discover a place like no other in the picturesque foothills of Evergreen, Colorado only 30 minutes west of Denver, at Colorado’s most romantic Highland Haven Creekside Inn. A charmed location, nestled along 400 feet of the lulling Bear Creek, the Inn is just a short stroll from the intriguing town offerings; galleries, winery, live music, boutiques, and coffee shops. Ideal for business, we offer the most memorable meeting spaces coupled with accommodations expressly designed for the discriminating businessperson. We also have space for small weddings and social events. “Along the creek and among the trees,” 400 feet of Bear Creek, massive rock out croppings and landscaped beauty OR private lawn with views of Fern Gulch. Atmosphere/Decor: “Along the creek and among the trees,” 400 feet of Bear Creek, massive rock out croppings and landscaped beauty OR private lawn with views of Fern Gulch. Social Events: With pitched roof and timber beams, stone fireplace and hand-hewn logs the Dailey Cabin has an intimate and unique atmosphere. The Dailey Cabin can accommodate sit down events for up to 22 and cocktail or social events for up to 25 persons. Tables and chairs included in the Dailey Cabin site rental. Catering kitchen available- space and kitchen available for set up and take down when approved. Highland Haven Events Coordinator will be on-site for questions and assistance and can be hired for additional offerings. Corporate Events: The Dailey Cabin c. 1884 is the original building on the Highland Haven Property. This beautifully warm and inviting cabin has been fully restored in classic Arts and Crafts motif, with hand-hewn logs, high pitched timber beams, Persian rugs, and has the added ambiance of a stone fireplace. With two additional break-out rooms, the Dailey Cabins area comfortable accommodates approximately 20 people. This cabin is available for limited hours, please inquire. Atmosphere/Decor: With pitched roof and timber beams, stone fireplace and hand-hewn logs the Dailey Cabin has an intimate and unique atmosphere. Special Features: Built in 1884, gas-log fireplace, breakout rooms and attached outdoor patio. The Fireside Loft is perfect for corporate retreats. Very private, luxurious lodging with a combined conference area set in home like comfort. High ceilings, skylights and huge windows with picturesque views of Fern Gulch offer a secluded and relaxing environment to focus and get down to business. The fireplace, wet bar and private outdoor patio/Hot Tub are pleasant finishing touches to make your corporate or business meeting a success. The Fireside Loft at the Highland Haven Creekside Inn comfortably accommodates approximately 20 people for your retreat or meeting. Free Wireless Access. Atmosphere/Decor: The Fireside Loft is perfect for corporate retreats. Very private, high ceilings, skylights and huge windows secluded and relaxing environment to focus and get down to business. Special Features: Floor to ceiling windows, full kitchen, gas-log fireplace, private outdoor hot tub, private lawn, bedroom and en-suite bathroom for facilitator.